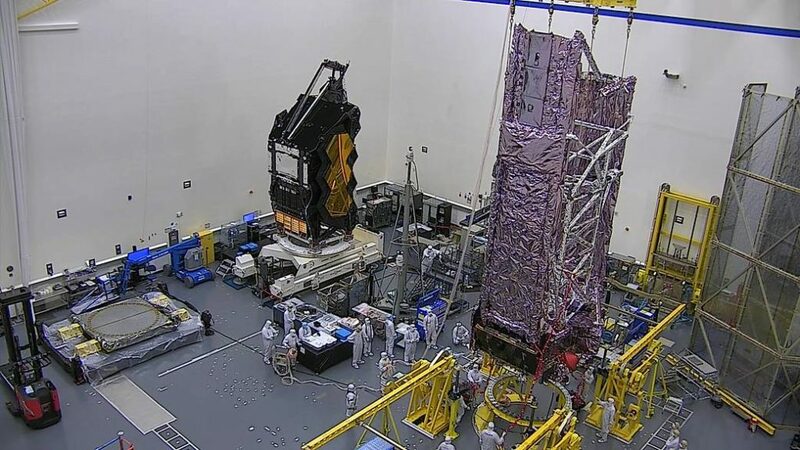 November 28, 2018 – NASA’s James Webb Space Telescope is both large and heavy, so it requires some big equipment to move it from one place to another during testing. The sunshield on the Webb telescope is 70 feet by 48 feet, or roughly the size of a tennis court. Once it and the attached spacecraft bus are combined with the telescope element, with its mirrors and science instruments, Webb will weigh almost 14,000 pounds, which is about as much as a full-size school bus. In this photo, taken at Northrop Grumman in Los Angeles, California, engineers were lifting the flight spacecraft element or SCE (consisting of the spacecraft bus and sunshield) off of the “elephant stand” upon which it was assembled. The SCE was then placed onto the In-Plant Transporter (IPT) for a carriage ride from the big cleanroom to the acoustics facility in another building. Once those acoustic tests were completed, Webb took another carriage ride to the vibration and thermal-vacuum facility in another building. After all the testing is completed, one more carriage ride will return it to this cleanroom where it will be assembled with the telescope element to form the full-up observatory that will fly in space. The James Webb Space Telescope will be the world’s premier space science observatory when it launches in 2021. Webb will solve mysteries of our solar system, look beyond to distant worlds around other stars, and probe the mysterious structures and origins of our universe and our place in it. Webb is an international project led by NASA with its partners, the ESA (European Space Agency) and the Canadian Space Agency. The eighteen mirror segments that make up the primary mirror were built by Ball Aerospace & Technologies Corp., in Boulder, Colorado. Ball Aerospace was also responsible for developing the secondary mirror, tertiary mirror and fine-steering mirror. Ball is the principal subcontractor to Northrop Grumman for the optical technology and optical system design.